To mark Finland’s centenary of independence, the holly blue (Celastrina argiolus) was voted the national butterfly of Finland. The first runner-up was the European peacock, and the mourning cloak reached the third place. 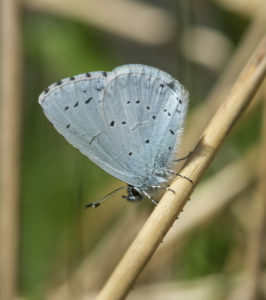 Over 6,300 Finns favoured the holly blue over other candidates. All in all, 36,500 votes were cast during the spring. Holly blue (Celastrina argiolus) – Finland’s national butterfly. Photo: Marianne Niemelä. The holly blue is one of the nine common blue butterflies in Finland. The species is widespread, but may be difficult to spot since it tends to fly high. 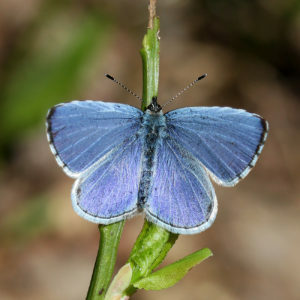 The holly blue can be seen throughout the country. The species is common in Southern and Central Finland, and during the 21st century it has also spread to Northern Finland and Lapland. Finland already has a national bird, animal, flower, fish, and tree. Several Finnish butterfly species have become rare due to changes in their environment. One of the aims of the national butterfly project was to spread consciousness about the butterflies of Finland and their environment. The First Lady of Finland, Mrs. Jenni Haukio, is the patron of the project. The project was organized by Vuokon Luonnonsuojelusäätiö (The Vuokko Foundation for Nature Conservation), Suomen luonnonsuojeluliitto (The Finnish Association for Nature Conservation), Suomen Luonto, Suomen Perhostutkijain Seura ry, and Etelä-Karjalan Allergia- ja Ympäristöinstituutti. You can also read about the winner here (official website of Suomi Finland 100). The project is organized by Vuokon Luonnonsuojelusäätiö (The Vuokko Foundation for Nature Conservation), Suomen luonnonsuojeluliitto (The Finnish Association for Nature Conservation), Suomen Luonto, Suomen Perhostutkijain Seura ry, and Etelä-Karjalan Allergia- ja Ympäristöinstituutti.